We consider TCS and Infosys as the leader in information technology sector and thus we will advise not to jump the gun and avoid getting caught in the fancy of getting a value buy at this point of time. Have a look at the charts as a picture never lies. Please note that this analysis does not mean that they are not good stocks but it means that you should buy these stocks only when they cross a particular level to get a good profit by holding for the shortest time frame. No doubt TCS and Infosys are quality companies and they will good returns in long term and these stocks have been also recommended as Best Large Cap stocks as per Mutual Funds Analysis with a long term holding term with a philosophy to buy and forget. If you are looking for short term holding stocks or intraday stock tips do remember to check these links as you can get good returns with minimum time frame. As per technical analysis of the stock do not buy Infosys unless it crosses above 650 level as in all probability it can fall till 585 levels. 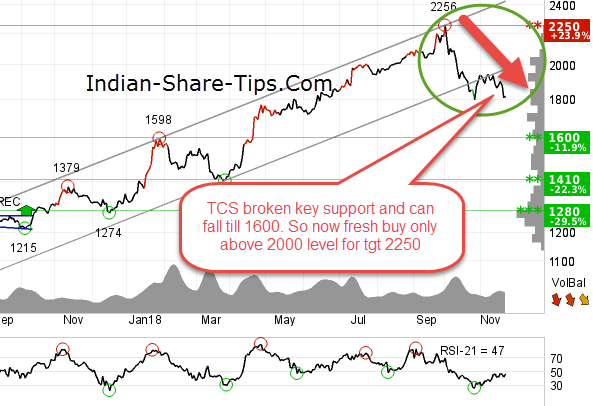 Remember that TCS becomes a Buy above 2000 level for target 2100-2200. So, remember timing is crucial to get in and out of the stock if you are looking at the short term perspective.